The Degree Certificate will be awarded by the Pebble Hills University and a Equivalency Diploma and a General Report will be granted by California University FCE. Pebble Hills University is accredited by International Accreditation Organization and World Council for Regular and Distance Education. PHU Degree Diploma will be notarized in District of Columbia and authenticated by the US Department of State. 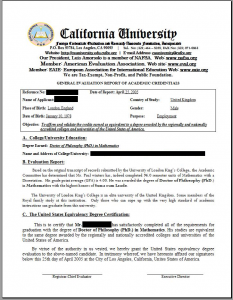 California University FCE equivalency-degree evaluations are generally accepted for immigration as well as Federal, State and private employment arenas. 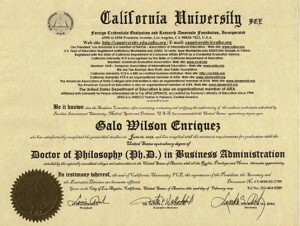 Below are articles discussing equivalency-degree awards. California University FCE progressively promotes honesty, integrity as well as academic excellence in education.